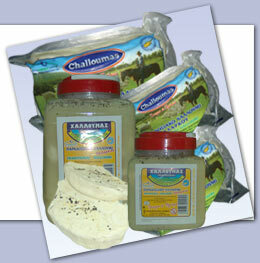 All our dairy products (halloumi, trahanas, etc.) are made from milk of our own production and process, of the best quality and standards. Our dairies are suitable for vegetarians, specially the Cyprus halloumi (Cyprus Cheese) and they can be included in well balanced healthy diet rich in nutritious ingredients (especially calcium) and low in fat. We have our own farm units and dairy factory, so we can monitor step by step the procedures and be sure of the quality of our products (Cyprus Cheese – Challoumi – Halloumi, Anari, Yogurt, Trahanas - Trachanas). We also give a great attention to the delivery and distribution department, so our dairies are delivered fresh and intact to the consumer in every town all over Cyprus: Nicosia (Lefkosia), Limassol (Lemeso), Larnaca (Larnaka), Paphos (Pafos) and Famagusta (Paralimni and Agia Napa). All our dairy products are manufactured under the HACCP specifications. 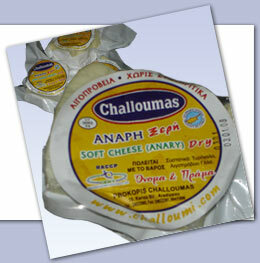 Challoumi - halloumi is the traditional Cyprus cheese Cyprus. It is made by the old Cyprus traditional method of talariou. A mixture of fresh milk is put in big straw canes, for straining and to form into shape. It is cooked at 85 °C - 90°C. Afterwards it’s folded and put into salted water, seasoned with mint leaves. That’s how haloumi, Cyprus special cheese has this unique taste and texture. 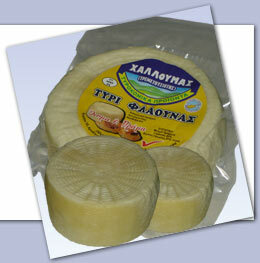 Cyprus Halloumi is one of the best Cyprus manufactured dairy products. It is the Cyprus traditional sheep yogurt, made from 100% sheep milk of our own production and process without any preservatives or additional substances. «Flaouna» is a traditional Cypriot delicacy made with special cheese that rises and doesn’t melt easily. 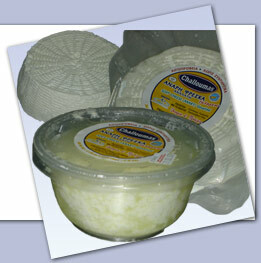 This special cheese is produced with the same method as challoumi, but it is not putted in salty water. Produced by sheep's milk and we use it for Easter Bread. “Anari” is a sort of soft white cheese, very rich in proteins. 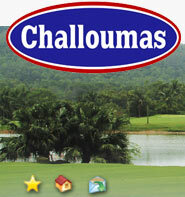 It’s a by-product of the whey that drains during the making of chaloumi. We warm the whey for 1 hour and when its temperature gets over 85ºC, soft cheese - Anari is beginning to form. Dried Anari is the same cheese as fresh, soft anari, but it’s cooked and dried in special ovens. 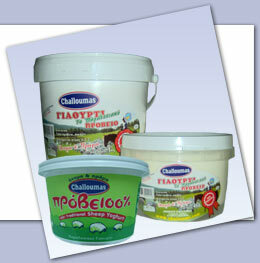 Trachanas, or Trahanas is made with wheat and fresh milk of our own production (70% sheep milk and 30% goats milk). The milk is boiled up to 85ºC and then the wheat is added. When this procedure is done, this mixture of milk and wheat is covered up for 24 hours, until the wheat absorbers all the liquid. This blend, trahanas, is cut into pieces and baked in a special oven. Trahanas soup is made from semolina grain, which is traditionally combined with wheat flour, milk, and eggs to make a side dish similar to soup. 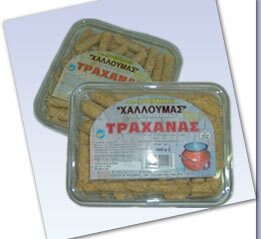 Trahanas is available as a sweet or sour product that can be served simply as a pasta dish or it can be combined with other ingredients, such as sausage and feta cheese, to create a flavorful main dish.